DSV Global Transport and Logistics offers transport services worldwide and employs around 44,000 employees in more than 80 countries. In 2010, one DSV division with 10,000 employees around the world established a Business Change Management (BCM) unit. The vision of this unit was to ensure increasing competitive advantage for the entire division by continuously offering a centralized and strategic approach to project implementation and processes focusing on cost reduction and profit optimization. The value of a structured approach around Change Management has been one of the best decisions we have taken. Approaching all countries in our Division in the same way and having the same language has proven to be a strong asset for increasing awareness around change management but also for creating trust and loyalty between our team and the business. To increase competitive advantage by improving organizational change management capability, maturity and effectiveness. DSV partnered with proacteur, a Prosci affiliate based in Denmark. Working with proacteur, DSV invested in the Prosci Change Management Practitioner Program and integrated it with DSV’s unique culture. With support from and knowledge sharing with proacteur, the DSV team has reached new heights in their change capability and are experiencing a higher return on investments. The first priority for increasing maturity was to create visible wins. Therefore, the change team began their efforts by applying the Prosci methodology on two pilot projects. The preparation and reinforcement change management provided on these projects resulted in a positive return on investment, both in terms of project success and structuring change management work. These projects were the first time The BCM team introduced the Prosci ADKAR® Model to a project team, and its simple mindset was one of project team’s greatest takeaways at the project end. The ADKAR Model proved to be a simple and pragmatic approach for leading their employees safely through times of change. The BCM team received positive feedback from involved managers, directors and executives who have applied the model. After the initial successes of change management on these pilot programs, the BCM team began the work of merging the division’s project management methodology with the Prosci change management methodology. 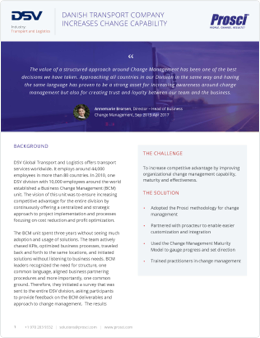 Not only did the BCM team integrate change management with project management, they also established local BCM teams in 22 countries within their division and introduced the ADKAR Model to more than 350 managers. They also trained 26 change practitioners who will offer change management services throughout their and other DSV divisions, bringing change management to more parts of the organization. Read the full DSV Transport and Logistics success story - including how the company integrated change management and project management - when you download the PDF.